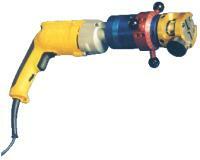 Delivers high quality weld end preparations on all types of material and piping configurations. Accurate, burr free weld preparation is achieved with minimal effort due to the newly designed micrometer feed system allowing controlled, smooth and constant feed rates. Interchangeable collets provide clamping and prepping ranges from 1/4" to 3" O.D. tube. Short gripping length collets allow excellent clamping clearance for remachining most micro fittings. Both AC and DC models are available. Use portably or mount for high volume production. Unique quick locking system assures that each machined part is quickly and accurately held in place.